I do not know many Moms that don't like custom gifts! 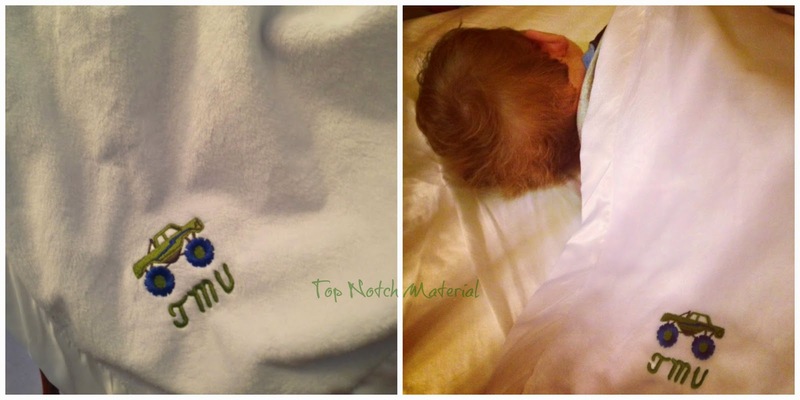 I have always felt that custom, embroidered gifts are the best gifts to give for baby showers! To me, a custom gift makes me feel like more thought was put into it! I recently reached out to Mr. Stitches and they offered to send me a custom baby blanket! I really loved that they are very open to design options and actually told me to look around online to see if there was a design in particular I liked! I found a cute monster truck, and since my youngest loves them, we decided to go with that! The blanket that they sent me is quite large and more than covers my 30 lb little boy! It is very soft, and my son loves it. He often crawls into our bed, covers himself up with the comforter and then puts this Mr. Stitches blanket on of that!! It is a new favorite sleepy item! "Here at Mr. Stitches Custom Embroidery we wanted to change things up. We know that shopping is not just a means to and end, but more so an experience. And although we love going to our local shopping mall from time to time, certain purchases are better done right from the convenience of your computer. This is why we have created Mr. Stitches Online Custom Embroidery to offer you an online shopping experience to order custom embroidered apparel and merchandise like polos, caps, hoodies, baby gear, uniforms, etc… You choose the apparel you want to customize, add a unique design and Mr. Stitches takes care of the rest." Mr. Stitches does not only offer custom baby items, but also pretty much anything that can be customized. There are shirts, caps, golfing clothes! They are incredibly affordable, and you will receive a discount for quantities of 5 or more ordered! There is NO MINIMUM to order though, which is awesome! This is such a pretty blanket and my sister would love one of these custom blankets for my nephew. I will have to take a look at the products that they can customize! I love the little truck that you have had embroidered on the blanket. I will check out this online service as well!